Well all the crew here have decided that I've gone on holiday already! Are they trying to tell me something? Anyway, here's a last article from me before I head off to Cornwall to find some sun, sea and pasties. 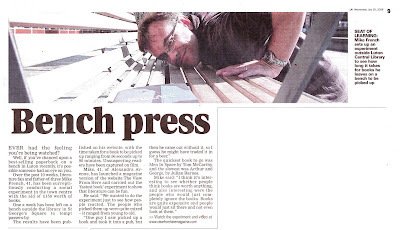 Spent Monday doing strange things on a bench for the local paper to get the shot above! Click on the image to enlarge the article to read it. And if your dropping in to find out about the book giveaway we did, here's some links to help you find out just what went on! That's it. See you all in September. The rest of the crew will keep you all informed, entertained and inspired through August. Save me some party food guys. You're the Lone Ranger? No. It can't be! First it was Father Christmas, then the tooth fairy, and now the masked man. Is nothing sacred? Stella, come on. If we're throwing a big bash for Paul, for ourselves, maybe we should include Mike. The LR's different. Besides his laconic nature, I bet he wears not just a mask but spurs, too. Imagine then what a great party it would be with both guys, disco ball or not. Don't tell the children Paul. No problem with wild parties Stella - just take the pictures down before you start. Kathleen, thankyou my good woman. Spurs? Of course, even in bed. Mike: You double crossing no good, take all the glory cheat, after I spent all those hours sitting around for you. How could you?